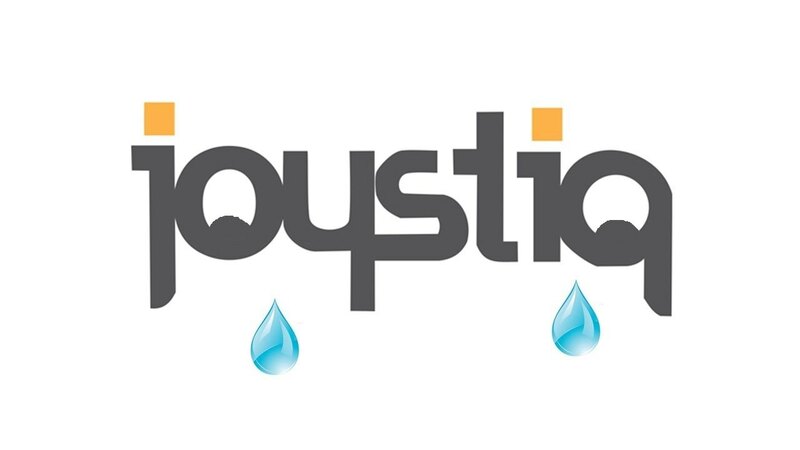 Joshua Wise is an Active Duty soldier in the US Army who when not jumping from helicopters and shouting at Privates, plays and writes about the games he's been playing for nearly twenty years. Opinions expressed belong to the author, and do not represent the United States Army, DOD, or any governmental body. Here at Reaxxion, we’ve been talking about Batman: Arkham Knight for a while now. We’ve been talking about the Season Pass or how well the Bat-Tank handles through the streets of Gotham and the embarrassing PC launch, so now it’s time for a full-out review of the game. First off, it’s good, let’s get that out of the way immediately. It’s not as good as Arkham City or as perfectly paced as Asylum, but it’s good. The game has been out long enough, so I feel no shame in spoiling plot details, so consider this your warning. 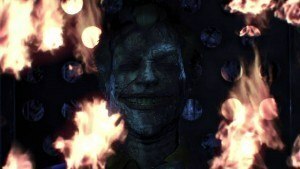 It’s been nearly a full year since the death of the Joker during the events of Arkham City. Gotham’s crime rate is down, but a war is on the horizon over the power vacuum his death created. Without the Joker keeping the balance between supervillains in check, they join forces to kill Batman once and for all, led by Scarecrow’s master plan and backed by an army commanded by the mysterious Arkham Knight. 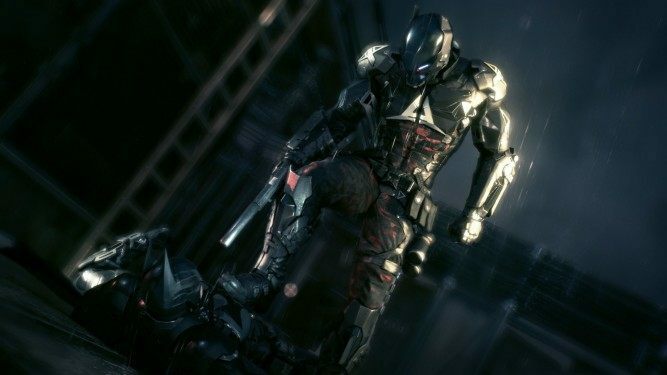 The identity of the Arkham Knight was the subject of much speculation during the games development and marketing. The most common theory thrown out is that he was the second Robin, Jason Todd, who met a grisly fate at the hands of the Joker. This was my first guess as well, and I assumed I was wrong about it because they announced a Red Hood DLC shortly after. That was a hell of a misdirection, because it is Jason Todd, and it works. Christina Bell represents the Joker’s obsession with Batman. If there is one thing that bothers me about the Arkham series, it’s that they have no idea how to write a story without the Joker. I understand he’s very much a large part of the lore, but he’s in all four games and he’s the most intrusive when he’s dead. 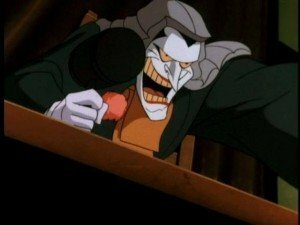 Scarecrow’s toxin causes Batman to hallucinate the Joker for the entirety of the game, mocking the Dark Knight and engaging in fairly humorous banter. During the events of Arkham City, Joker shipped his infected blood to hospitals all over the state. Four people received a transfusion of the blood and were not treated with the cure due to administrative oversight. This illness, a result of the Titan formula from Arkham Asylum, killed the Joker, but his infected blood isn’t killing them, it’s turning them into carbon copies of the Joker. They all represent different aspects of the Joker personality, but this is retarded even for comics. Batman states it’s a more extreme version of Creutzfeldt-Jakobs Disease (CJD), which in layman’s terms is called mad cow disease. This is obviously a reference toward the fact anyone who could have potentially been exposed to this cannot donate blood, myself included as I was born in Germany during the late 80’s. Soon Batman begins to fight for control of his mind with the Joker, because he’s also infected with that blood. Here’s the thing though: he was given the cure, so why the hell is this an issue? Why is Batman exhibiting the same symptoms as the other four, when the reason they are becoming the Joker is because they weren’t given the cure? I know I’m being needlessly picky, but I hate how self serving this script is. 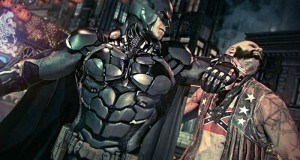 Does the Confederate Flag mean we have to ban Arkham Knight? The fighting in this series has always been incredible. When Asylum was released, there truly was nothing like it. Every game, even Origins, added something new to the combat. Arkham Knight adds the ability to hit downed enemies so you don’t lose your combo streak. You can also pick up bats and poles your enemies drop, which can be used to beat down brutes who are otherwise impossible to hit without stunning them first. 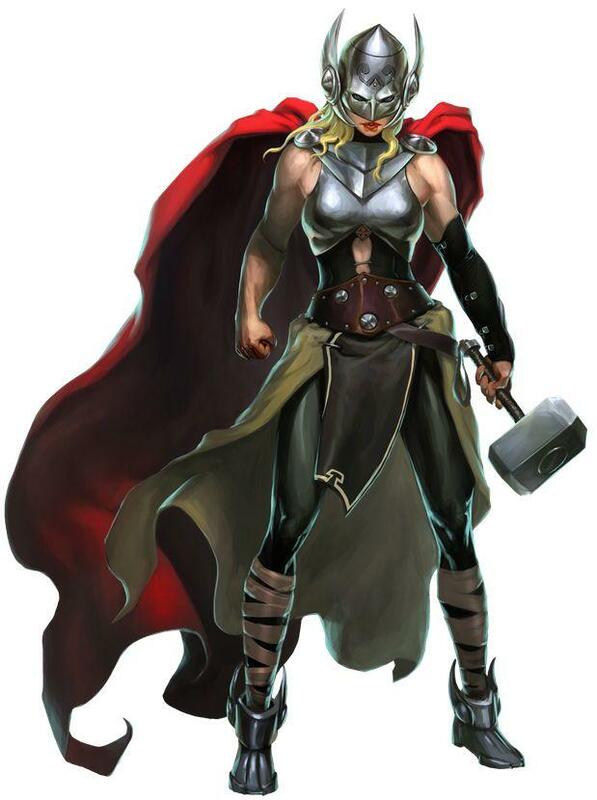 You can fight with multiple characters that aren’t merely new skins on DLC or challenge modes. These fights are honestly awesome. Getting to fight with both Batman and Nightwing is truly great stuff, and the viciousness of the dual attacks is a sight to behold. The game also adds several new challenges in stealth, such as drones and enemies who can triangulate your position when you’re in detective mode. There are even enemies with armour that makes them invisible in detective mode. Now all I need is a detective scene that isn’t just an interactive replay where the game solves it for me. Gameplay is amplified greatly with the introduction of the Bat-Tank, allowing for a fresh take on puzzles and combat… which wears out its welcome really fast. The issue isn’t driving it: though it takes a while, once you get used to the controls, driving it is satisfying. My issue is how much of the game you use it for. I’m playing as Batman! I want to glide from the rooftops and pounce on thugs and villains. I want to sneak and stealthily disarm bad guys. I want to investigate crime scenes. What I do not want is to spend nearly half of the game in a driver’s seat. To their credit, Rocksteady promised the Bat-Tank and they delivered, but I feel I’d be less disappointed if they overexaggerated its presence. Chad Hargrove wrote an entire article on it, go check it out. The best music of the series is by far from Arkham City, but it does its part here. The shining star is still the voice acting. Rocksteady spares no expense on voice talent, particularly when Mark Hamill returns as the Joker, replacing Troy Baker who replaced him. I’m not going to assume something happened there, because Troy Baker is voicing Jason Todd and Two-Face. If you have the choice to have Mark Hamill voice the Joker again, why pass that up? Also, John Noble is always a welcome addition to any cast. Making a character who can control plants “realistic” is missing the point. 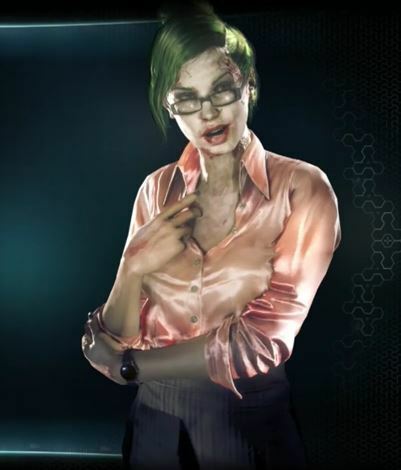 Above, we have Poison Ivy as she appears in Arkham Asylum and Arkham Knight. 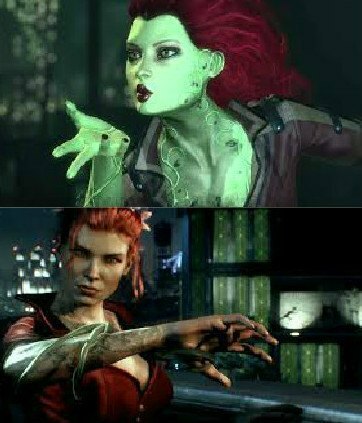 Harley Quinn, Barbara, and Vicky Vale all look perfectly fine, but Poison Ivy is a curious choice to attempt to make more realistic. Attempting to make her look human misses the point entirely. To say they make her look ugly is a stretch and subjective; the real problem is trying to make her look human at all. Gameplay: 40/45. There are new ways to hit enemies, sneak around, distract, and get from place to place. The fighting has been immeasurably improved and the inclusion of dual combat is a welcome addition. I only dock it for how intrusive and overwhelming the Bat-Tank is to the overall gameplay time. Controls: 24/25. It’s not perfect, and sometimes I know damn well I countered in time, but the controls are still damn near flawless. Once you get the hang of the Bat-Tank, it handles really well. Graphics: 14/15. I feel the aesthetic choices in regards to Ivy and other female characters are relatively minor to the overall look of the game. It looks pretty damn good. Attention to detail, including Batman hallucinating the Joker’s face on billboards and statues, is icing on the cake. Sound: 10/10. The music is great, but the voice talent, as always, is phenomenal. The real meat of the sound is the banter of thugs as you fly over. 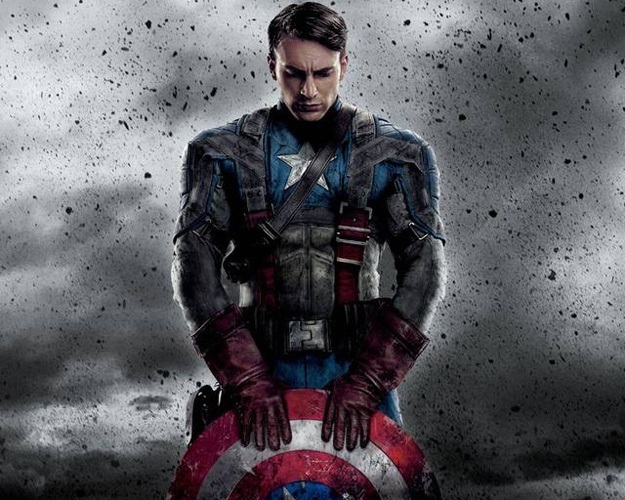 This is a great way to deliver exposition and really flesh out the world. Story: 4/5. The retarded turning-into-the-Joker plot doesn’t take too much away from the core theme of the game. The real theme of the game is guilt. Slowly watching the toxin take it’s toll on Batman—and the hallucinations brought on by the guilt—is truly gut wrenching. Total: 92%. It’s a hell of a game, with sufficient replay value. Beating the plot first then the side missions actually changes the in-game dialogue. It’s entertaining and a must-play. Masculinity Score: Feminists are upset because every woman in the game either spends the entirety of it captured, is killed, or is batshit (pun intended) insane. Never mind the fact that these women demonstrate agency and are far from helpless. Batman will keep making the necessary sacrifices to save the day, and refuses to have any more casualties because of him. Manly, through and through. Lastly, I’ll attempt to answer the question of whether or not the Season Pass is worth it. The DLCs add nothing besides some minor backstory, and only take around 10-15 minutes to beat. As it stands right now, the answer is no.